Proportion- comparative relation between things or magnitudes as to size, quantity, number, etc. 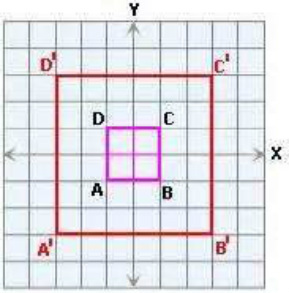 The dilation of this oblect has a scale of 1:3. Scale- you can find the scale by taking the coordinates of one point and finding a common relationship to the cooresponding point. Practice Problem 1:the points of a trianlge are A(5,2), B(1,-4), and C(-1,0). they are dialated by 3. Step 1-Multipy both sides by 10. Step 2-Divide each side by 7. Practice Problem 3; Real World Problem: The perimeter of a pool is 408, and the ratio of its length to width is 10:7. Find the area of the pool. Step 1-Write expressions for the length and width. The ratio 10:7 can be written as 10x and 7x. Step 2-Write an equation to solve for x.